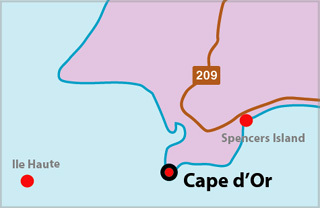 For visitor's information, go to Cape d'Or on Facebook. The keeper's houses were left vacant after 1989, but fortunately they were not removed or burned. In 1995 the Advocate District Development Association obtained a lease through the County of Cumberland and repaired the houses. Today, one is the Lightkeeper's Kitchen and the other a Guesthouse. 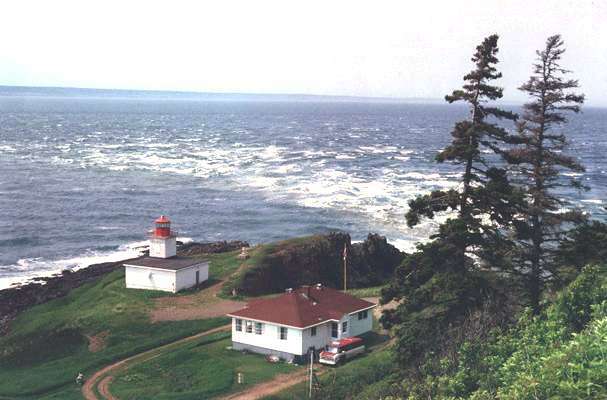 This is the only lightstation in Nova Scotia where you can stay in a keeper's house. Part of the Fundy Shore Ecotour. A fog whistle was established on the cape in 1875 to warn mariners of the tidal rips. The first light, a square wooden tower, painted white, standing on a red wooden trestle, was built in 1922. This light was a typical small "pepperpot." 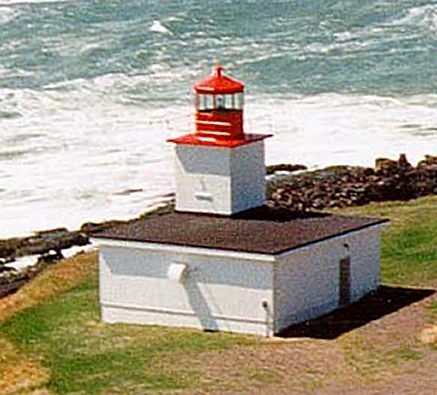 It is believed to have been moved to the cape by water from Apple River by Percy Smith and brought up the cliff from the cove to a site just beyond the present lighthouse. A steam fog signal, in a wooden building painted brown, was installed at the same time as the lighthouse. From the evidence in photographs, the first keeper's house was built at the site of the current lighthouse. Walter Barteaux, whose father kept the light for 19 years beginning in 1939, recalled that "Sometimes the roof of the old house we lived in used to lift a bit in the storms and rocks would blow up from the cliffs or the sea would fire wood up the bank." He grew up at the cape and went to school from there. "It was five miles to the local school and most of the time we walked. There were no roads here, just a wagon track in those days." The current keeper's bungalows were built in 1958/59, and the concrete lighthouse in 1965. Ernie Morris was the last keeper. The light was automated and de-staffed in 1989. In 1980, an archaeological dig just west of the lighthouse discovered tool fragments of aboriginal people which were dated to about 2000 years ago. Cape d'Or was the last verified nesting site in Nova Scotia for the rare Peregrine Falcon. When attempts to re-establish the birds began in 1982 it became a falcon release site. You may see these birds if you visit. Rare plants, normally found only at high altitudes in the Rocky Mountains grow on the cliffs. You can stay at the keeper`s house in the foreground, and enjoy a delicious meal at the second house. The massive Fundy tides roar past this light.house The keeper`s house in the foreground has been restored and is now the Lightkeeper`s Kitchen Restaurant. Cape d'Or, low and green, is the south extremity of a ridge, 500 ft (152m) high, separated from a promontory to the north by a deep valley. The west side of the ridge, north of the cape, consists of cliffs about 200ft (61m) high. With a flood tidal stream, there is a heavy tide rip close south of the cape. The lighthouse stands below a cliff, almost at the tip of the Cape. Light Height: 079ft feet above water level.